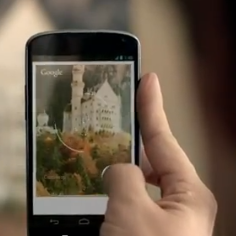 In a pair of new thirty-second ad spots, Google is showing off what it does best – search. The spots both feature Google's Search app for Android, using the same cozy, refined aesthetic as Google's other ads in recent memory, even showing off Search's new "search with camera" functionality. The first spot follows the story of a nervous job candidate, gaining some insight into his prospective employer's interests with a last-minute Google search, while the second spot shows us a "smart Dad" who uses Google Search as a cheat sheet to answer his inquisitive son's astronomical questions. Without further ado, here's the new set of ads.